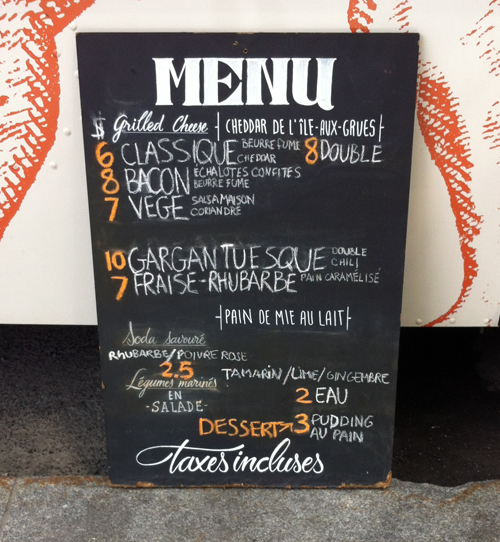 On a hunt to find food trucks in the Square-Victoria area, we luckily came across not one, but two on the corner of St Jacques St and Gauvin St: P.A. & Gargantua and Phoenix 1. 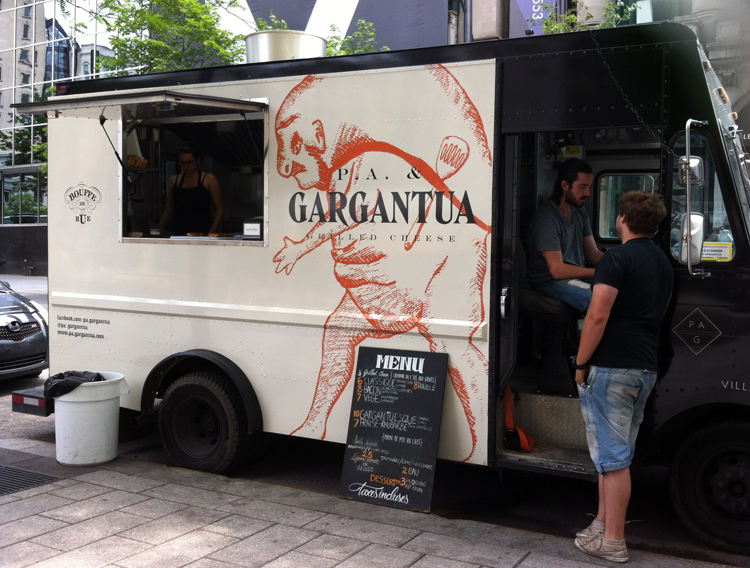 When I first read about Gargantua I couldn’t wait to try their food. Gourmet grilled cheese sandwiches – who wouldn’t love those? Their menu selection isn’t bad: from basic grilled cheese ($6) to their “Gargantuesque” double grilled cheese with chili ($10) – I had to try them first. Lucky for me, the line up was quite small and the wait after ordering took only 5 minutes. 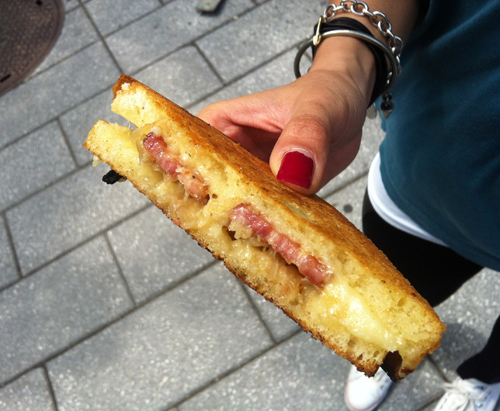 I ordered the bacon grilled cheese ($8): delicious white cheddar cheese from the tiny Isles-aux-Grues in Quebec, hearty Canadian bacon, caramelized shallots, smoked butter, sandwiched between 2 slices of fresh pain du mie au lait. Was it any good? To die for. I licked every greasy finger after devouring the semi-small sandwich in all of 2 minutes. Mark ordered the “Gargantuesque” ($10): same delicious cheese and bread, but with an added layer of mild chili in between. The chili was flavorful and certainly fresh, but it lacked a bit of the saltiness my bacon sandwich had. We didn’t try their sodas, although I’ve heard great reviews. I was too excited to try their food I completely forgot to even order a drink. All in all, the food quality was fresh and tasty. I’d definitely hunt down this food truck for some late night / after drinking dining if it were open and roaming the city.